3 men were killed by an explosion in No 3 & 4 Drumpeller Colliery belonging to Summerlee Iron & Steel Co caused by a shot igniting coal dust. One of the rescue party who recovered the bodies was also killed. Circumstances attending the Accident which occurred in Nos. 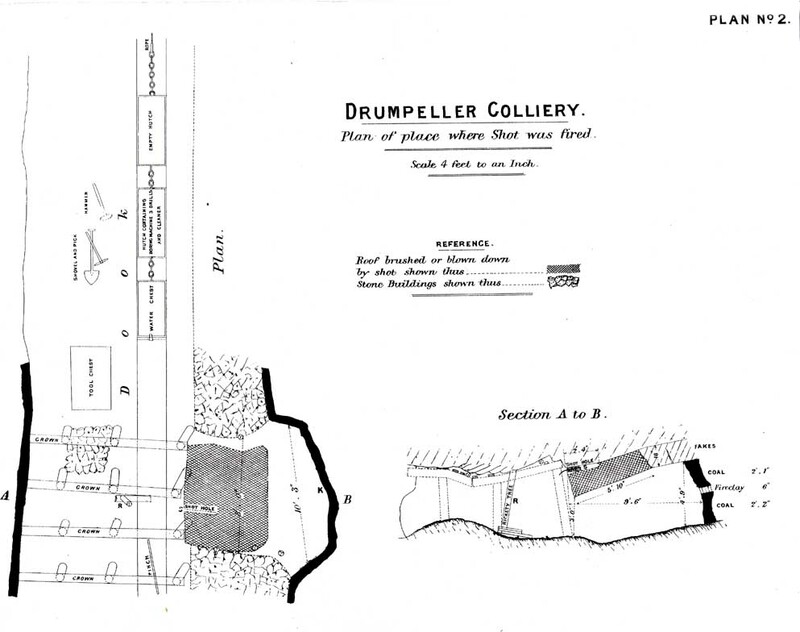 3 & 4 Pits of the Drumpeller Colliery, Coatbridge, on the 28th January 1898, by J. M. Ronaldson, Esq., and Henry Hall, Esq. In accordance with your instructions, we have the honour to present to you the following report upon the explosion by which four persons, Robert Drummond and John Gordon, firemen, and Thomas Ward and William Chalmers, brushers, lost their lives on 28th January in Nos. 3 and 4 pits, Drumpeller Colliery, belonging to the Summerlee & Mossend Iron & Steel Co., Ltd., and situated near Coatbridge, Lanarkshire. Description Of Colliery. The colliery is an old one, and the winding shaft is 118 fathoms deep to the Kiltongue coal, which is the only seam now being worked. The coal, which is about 4 1/2 feet thick, has been worked on the "stoop and room" system, and, as the accompanying Plan No. 1 shows, it is now almost exhausted to the dip of the shafts. The shafts are rectangular, No. 4 being 14 feet by 5 feet and No. 3 being 12 feet 4 inches by 4 feet 8 inches. The latter is the winding shaft. The floor of the seam is fire-clay, and the roof is freestone rock. The inclination of the strata is about 1 in 4, and the dook on which the explosion took place dips at the rate of 1 in 5. It originally extended about 780 yards from the shafts, but this length has been reduced by the extraction of the stoops to 330 yards. This dook is a main haulage road, the haulage being performed by a steam engine placed near the pit bottom. Ventilation. No. 3 is the downcast, and No. 4 the upcast shaft. Ventilation is maintained by a steam jet at the bottom of the upcast, and by the heat radiating from a column of steam pipes which is carried down the shaft to the pumping and haulage engines, the exhaust steam from which also assists. There are two separate air currents, one for the rise workings and the other for the dip. The split for the dip workings passes down the dook and up the return airway, as shown by the arrows on Plan No. 1. The colliery was worked entirely with open lights. There were 80 persons employed below ground during 1897. Previous Explosions. When the Kiltongue seam was being opened up fire-damp was frequently found, but latterly its presence has not been so often recorded. Since 1875 there have been two fatal and at least five non-fatal explosions, the last explosion of fire-damp was on 29th September last, and by it a fireman in the dook section, while making his inspection with a naked light, was so severely injured that he died from his injuries. There has also been a case of the coal dust on the dook being ignited by an untamped shot of blasting gelignite, fired to break up a stone. Coal Dust. The dook workings are dry, and the haulage road (engine dook) is very dusty, the fine coal dust being several inches thick in some parts, and adhering thickly to the timbering and sides. The only means adopted to lay the dust was to turn on a stream of water from a hose at the top of the dook and let it run down between the rails. This was done every other day, but apparently the only effect was to damp the dust which lay near the rails, leaving the sides, the roof, and the greater part of the floor untouched. Officials. Mr. David M. Mowat who was manager up till February 1895 has since that time acted as agent, Mr. Thomas Goldie is the manager and also acts as overman, while there were three firemen, viz., George Davidson and John Gordon for the day, and Robert Drurnmond for the night shift. Narrative Of Explosion. On the night of the 27th January a miner named Thomas Rodgers broke away a place B off the side of the dook about 260 yards from the east level off No. 3 pit, and after removing the building along the side of the dook he took out a portion of coal, as shown by the enlarged Plan No. 2. The excavation in the coal measured about 10 feet by 3 feet, the face K being only 9 1/2 feet distant from the air current passing-down the dook. Owing to the rails on the dook being above the level of the floor in this new excavation it was necessary to "brush" or blast down a portion of the roof, and Thomas Goldie, the manager, arranged that the two deceased brushers, Thomas Ward and William Chalmers, should do this work on the afternoon of the 28th. The dook section was worked by two shifts, and the brushers were to have the brushing at B completed before the night shift came on at 8 p.m. Thomas Ward left home that afternoon, taking with him, according to the evidence of his mother and sister, 4 1/2 lbs. of compressed gunpowder in a tin case about a foot in length. He and Chalmers went down the pit shortly after 3 p.m. Hugh Creaney, bottomer, stated that he noticed that Ward had a bulky parcel rolled up in paper, which was sticking out of his inside jacket pocket. Ward told him that he would require to go into the west level to get his "graith" (tools), and then, pointing to the parcel in his pocket, added, "I'll need to hide that when I am in there." The manager saw Ward and Chalmers before they left the pit bottom, and, according to his own statement, he then told them for the first time that roburite was the explosive to be used, and that they were not to fire the shot, as Drummond, the night fireman, was to do this. The manager then ascended the shaft and met Robert Drummond, night fireman, whom he thereupon appointed in writing to be the shot firer in terms of Section 2 (c) of the Explosives in Coal Mines Order of 20th December 1897. This appointment was signed by Drummond as well as by the manager, and was left in No. 4 pit engine-house. 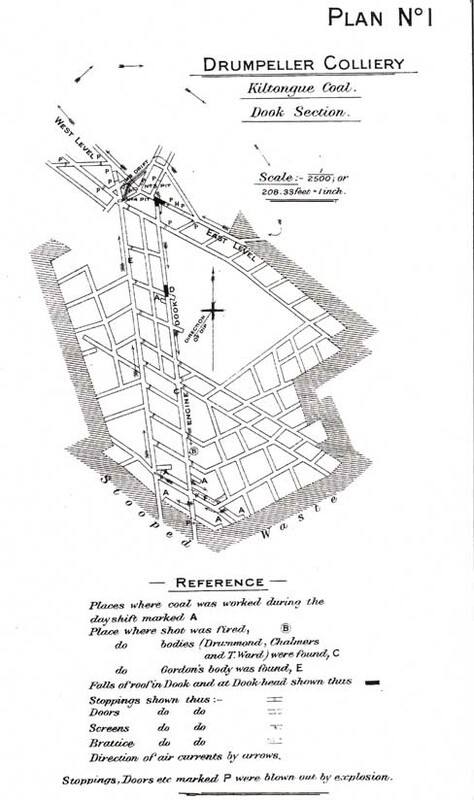 The manager also stated that he told Drummond to water the dook for 20 yards on each side of the place where the shot was to be fired, and that he was to take with him down the dook the water chest which he had told the bottomer to fill for this purpose, and that if one chest full was not sufficient he was to return to the pit bottom for more water. Drummond went down the pit at 4.30 p.m., and the bottomer, having coupled the full water chest to two empty hutches attached to the haulage rope, he (Drummond) went into the engine-house and lowered them down to the position shown by Plan No. 2. He then himself went down the dook about 4.40 p.m. Previous to this, Thomas Ward had come out from the west level with his boring machine, and it seems that before going down the dook he also went into the east level workings where lie obtained another boring machine. Ward followed Chalmers down the dook shortly before 1 p.m., that is, these men went down to the site of the shot nearly an hour before they were followed by Drummond the appointed shot firer. No one seems to know whether or not they took any explosive with them. Joseph Skinner, a miner who worked at the foot of the dook, stated that he and a miner named McAulay were the last of the day shift to go home, and that when going up the dook at 4.30 p.m. he passed Chalmers and Ward at the point B. Chalmers was then working with a pick at the place where the shot hole was afterwards drilled, as if preparing to commence boring, and Ward was sitting at the side of the road. At that time they had not erected the "rickety tree " (prop against which the boring machine was to be used while the shot hole was being bored). The bottomer went up the pit about 5 p.m., leaving Drummond, Ward, and Chalmers in the dook section. The only other person in the pit was George Davidson, the day fireman for the rise workings, who had been detained drawing props in the east level about a quarter of a mile from the shaft. The following is the statement made by David McDougall, the winding engineman :- "At 5.1.5 p.m. exactly I was in the engine-house, when I heard a gust of wind, and on looking out of the door towards the pit-head I saw volumes of black smoke vomiting out of No. 3 pit (the downcast). I knew that an explosion had occurred. The smoke would not continue to ascend for more than a minute. I. ran out, and met Brown, the pitheadman, and when we turned to look at No. 4 pit (upcast) we saw black smoke vomiting out of it. The smoke continued for two or three minutes, and was gradually dispelled. The air in No. 3 pit took its natural course again before the smoke came up the upcast. I then tried to run the cages in No. 3 pit, but found that they had stuck fast. About 15 minutes after the explosion a signal from No. 4 pit bottom was given, and after the cage was attached to the rope by Brown, I lowered it. and brought up George Davidson." James Brown, pit-headman, corroborates this statement, except that he stated that according to his time-piece the explosion happened at 5.10 p.m.
George Davidson, the fireman, who was in the east section, stated that about 5.10 p.m. he felt the explosion, but it did not put out his naked light. He at once started to go to the pit bottom, and when half-way out was met by the afterdamp, which was like steam or a white mist. Upon reaching the pit bottom the air there was quite clear, as the current was passing directly from the downcast to the upcast, owing to the separation doors having been blown down. He passed over a heavy fall at the top of the dook, and seeing no one in the east level he returned, and thinking No. 3 shaft injured by the explosion he went to No. 4 shaft, signalled, and was taken to the surface. Exploration. The manager and others arrived at the colliery, and descended about 6 p.m. John Gordon, day fireman for the dook section, descended about 6.30 p.m., and was followed by Mr. Mowat, the agent. It appears that, owing to a heavy fall of roof at the top of the dook, entrance to the workings by the intake was not possible, and the manager proposed to Gordon that they should go down the return airway E from No. 4 pit. Although the ventilation had not yet been restored by temporary stoppings, there was a current of air coining up the return airway, and they accordingly set off with naked lights, but after proceeding some 60 yards the after-damp began to affect them and they attempted to return. The manager nearly got up to No. 4 pit bottom when he was overcome by the after-damp, but was rescued by Mr. Mowat and others, several of whom also became insensible. Gordon, who had been a few yards in advance of the manager, lost his life, and his body was found at the point E at 2 or 3 o'clock next morning. About midnight, after a passage had been cleared past the fall at the top of the dook,-and another at the point D, the bodies of Ward, Chalmers, and Drummond were found at the point C, about 60 yards above where the shot was fired. They were all lying on their faces with their heads towards the top of the dook, Drummond being 5 or 6 yards nearer the shaft than the others, who were lying side by side on the top of a slight fall. Each body was severely burned. Appearance of Workings after the Explosion. We made an inspection of the dook workings on the 8th February, but minute inspections had previously been made by Messrs. Ronaldson, J. B. Atkinson, and Mottram, H.M. Inspectors. It ;was seen that without doubt a shot had been fired at a point marked S on Plan No. 2 (B on Plan No. 1). Plan No. 2 shows the vicinity of the shot at the time it was fired. S is the shot hole, 2 feet 4 inches in length and 2 1/4 inches diameter. R is the "rickety tree," set on three pieces of wood, which projected over one of the rails as shown, and this tree was still in position after the accident. The shot had brought down in large pieces the portion of roof shown by crossed lines, from a parting 18 inches above the coal. The outer portion of the shot hole remained intact, which was due to the fact that it had been commenced to be drilled above the parting, and 8 1/2 inches of stemming still remained in the hole, together with a portion of the burnt safety fuze. The stemming came to within 6 inches of the mouth of the hole. The portion of roof which had been in immediate contact with the explosive when it was fired was not in anyway pulverized, the marks of the drill, like the threads of a screw, being as distinct as they were where the stemming had been. The water chest, coupled to the two empty hutches arid the rope as shown, was 4 yards from the shot hole. It was empty, with the plug in and the lid off, and was coated in the inside with coal dust. The timbering and sides of the dook in the vicinity of the shot were thickly coated with fine dry coal dust, and similar dust, several inches thick in many parts, covered the pavement. A careful search was made tor any appliance that might have been used to sprinkle the water, but none could be found. The explosion did not appear to have been a violent one. The only falls of any consequence were the two already mentioned, and the only injury done to the winding shaft was the displacement of one of the slides which was soon put right. There was evidence of coked dust on the dook above arid below the place where the shot was tired, and also in the east level 50 yards from the shaft near the point H, as well as at the point F where also a piece of burnt brattice cloth was found. This proves that the flames extended throughout the dook and for some distance beyond it. The stoppings and doors marked by the letters P were blown out. A cap with a lamp stuck in it was found on the dook 35 yards below the bodies, and these are supposed to have belonged to Drummond, while an oil flask was found about 14 yards below the bodies. It therefore appears that one or more of the deceased men had been able to proceed a short distance after the explosion. Result Of Investigation. As this explosion had been referred to in the public press as having been caused by the firing of a shot of roburite (one of the permitted explosives), it was most important that no pains should be spared to either verify or contradict that statement. Mr. Ronaldson, having suspected that gunpowder had been used, procured a portion of the stone which had been in contact with the charge of explosive, and on 2nd February left it with Dr. John Clark, the city analyst of Glasgow, for examination, and afterwards by your instructions a second portion of the stone was sent to Dr. Dupre of London. A formal public inquiry under the Fatal Accidents Inquiry (Scotland) Act was held at Airdrie on the 25th February. We were both present, and the whole of the circumstances of the explosion were laid before the sheriff and the jury, who found ''that the explosion was caused by a shot of gunpowder igniting coal dust." A copy of the notes of the evidence is sent herewith. We are entirely in accord with that verdict, and are quite satisfied that it has been clearly proved that gunpowder and not any permitted explosive caused the explosion. The two eminent chemists already named gave evidence on oath that the result of their analyses proved conclusively that no other explosive but gunpowder could have been used in the shot. This conclusion was corroborated by the physical effects of the shot, seeing that there was no pulverization of the stone in contact with the charge such as invariably occurs where roburite is used. Mr. Mowat, agent of the colliery, is a practical mining engineer, and he stated in his evidence that "It is now my opinion from what I have seen and heard that gunpowder was used. I have fired roburite shots since, and the effects are quite different." We are distinctly of opinion that the explosion was due to the ignition of coal dust which lay thick on the floor, sides, and timbering close to the shot hole. We feel that it is impossible to believe that fire-damp could have been present, as the two brushers drilled and charged the shot hole whilst carrying open lamps on their caps. They also must have gone under the which was blown down in order to knock out some props before firing the shot, so that had there been any gas present it would have been ignited at their open lights. The presence of fire-damp was all the more improbable seeing that the fresh air direct from the downcast shaft was sweeping past the mouth of the shot hole at a velocity of 200 feet per minute. We believe that it was intended by the manager that a permitted explosive (roburite) should be used, but that he failed to give the requisite instructions and to make such regulations as would ensure its use. We believe the true explanation of the firing of the fatal shot to be, that although the manager may have told Drummond not to use gunpowder, yet this order was never conveyed to the two brushers before they went down the dook to prepare the shot, and hence they used a part of the gunpowder which one of them (Thomas Ward) was seen to take with him to the colliery on that day. If this was not so, then we are compelled to assume that Ward and Chalmers immediately after having been forbidden to use gunpowder did deliberately set that order at defiance. The two men are dead and are not able to answer for themselves, and we find it very difficult to believe that such a flagrant disregard of orders could occur if proper discipline was maintained at the mine. With reference to the allegation that roburite No. 3 was the explosive used, the only evidence in support of this is the statement of the manager that he instructed the three deceased men to use it and appointed Drummond as shot firer, and the very doubtful assertion of Hamilton Ward, uncle of Thomas Ward, that two cartridges of roburite had been taken out of his tool chest which was placed at the point H in the east level, together with the statement of Thomas Ward's mother, that her son told her that he had to go earlier to the pit that day as he was to use a new explosive. We submit in conclusion that the Explosives in Coal Mines Order, Section 1 (2), was contravened, in that a gunpowder shot was fired in a dry and dusty part of the mine, and that General Rule 12 (h) and (i) of the Coal Mines Regulation Act, 1887, was contravened, in that the place of firing, &c., was not in a wet state from thorough watering in all parts where dust was lodged, as is required when blasting in a dry and dusty place contiguous to a main haulage road. It was given in evidence that only one water chest containing about 55 gallons of water was taken down the dook on this occasion, that there was no appliance better than an ordinary shovel with which to apply the water to roof, floor, and sides, and that in consequence of the tram road being blocked by the prop supporting the drilling machine the chest of water could not be taken farther down than the drill hole, so that the 20 yards of the dook beyond the shot and required by law to be watered could not be so treated with an appliance such as a shovel arid in the time at Drummond's disposal. It also appeared in evidence that explosives had been taken into the mine by Thomas Ward not in a secure case or canister, in contravention of General Rule 12 (b). The lesson which this explosion at Drumpeller Colliery teaches is, that wherever it is necessary to use permitted explosives in a seam the precaution should extend to the whole seam. There would then be less temptation to use gunpowder surreptitiously, and any attempt to do so would be the more readily detected.